The Lawn Fawn Summer Release is now available and I definitely have “full set” syndrome about it. Virtually every product in this release is awesome, and I have been snapping up whatever, I have been able to grab. I had a sneak peak of the stamp set and die that I am using today back at Creativation in January. I knew it was going to end up in my stash when it came out, as it was just SOOOOO cute. You will note that just like in real life, it is virtually impossible to actually get the bear into the exit tube, but isn’t it fun to spend time, money and effort in trying to anyway! Supplies: Lawn Fawn You’re Clawsome stamp set and die, Kaisercraft Teddy Bear’s Picnic patterned paper (a match made in heaven but no longer available), Scotch foam tape, Simon Says card base, Lawn Fawn Slider dies, Scor tape, Copic Markers and Recollections heart enamel dots. Today is bloghop day at Papertrey Ink. 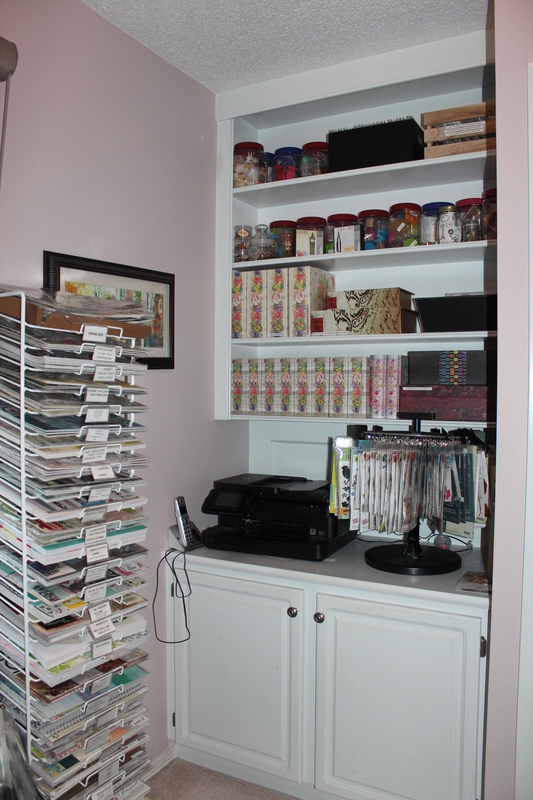 It is also the day that I decided to clean up and re-organize my craftroom for about the hundredth time. My current idea is to have the room look better while remaining organized and still having stuff “at the ready” should I wish to craft. It just so happens that changing the way I store my Papertrey Ink stuff was first on my list. I can honestly say it looks much better now. The question is will I be able to actually find what I need, and will I be able to keep it neat. Time will tell. The bottom shelf is all Papertrey Ink stamps and dies with the exception of the two book-like pink boxes. Subsequent to this photo, I added discreet labels to the boxes to tell me what type of stamps/dies are in each box. 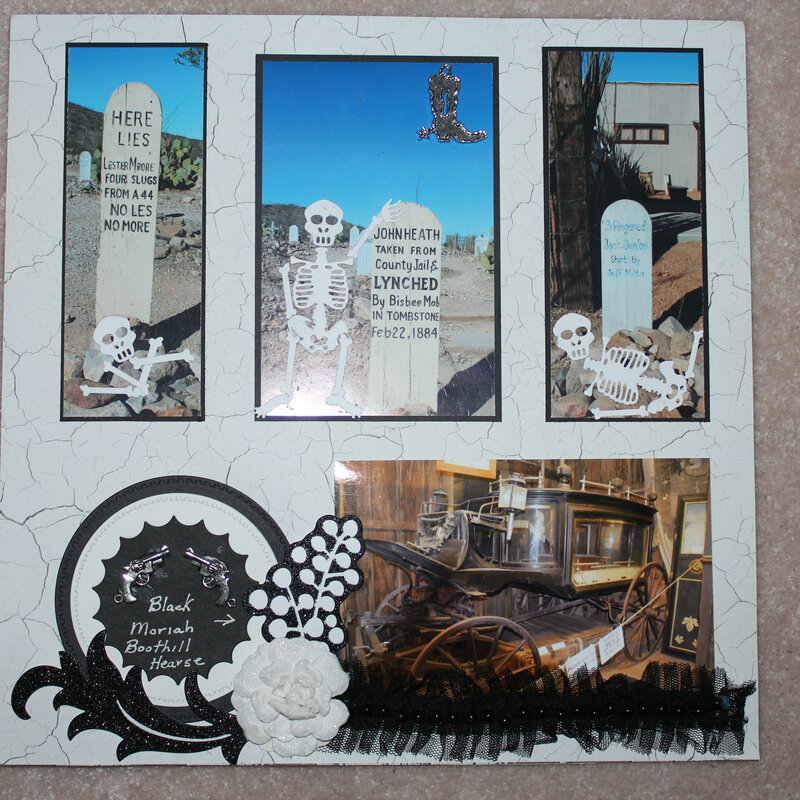 During the re-org I came across the Doodlie Do stamp set, which I thought would work well with the Inspiration Photo. I like the look of the card……….the big question now is did I save a spot in one of the boxes to put away the stamp set. Supplies: Papertrey Ink Doodlie Do stamp set, Copic markers, Nuvo drops. 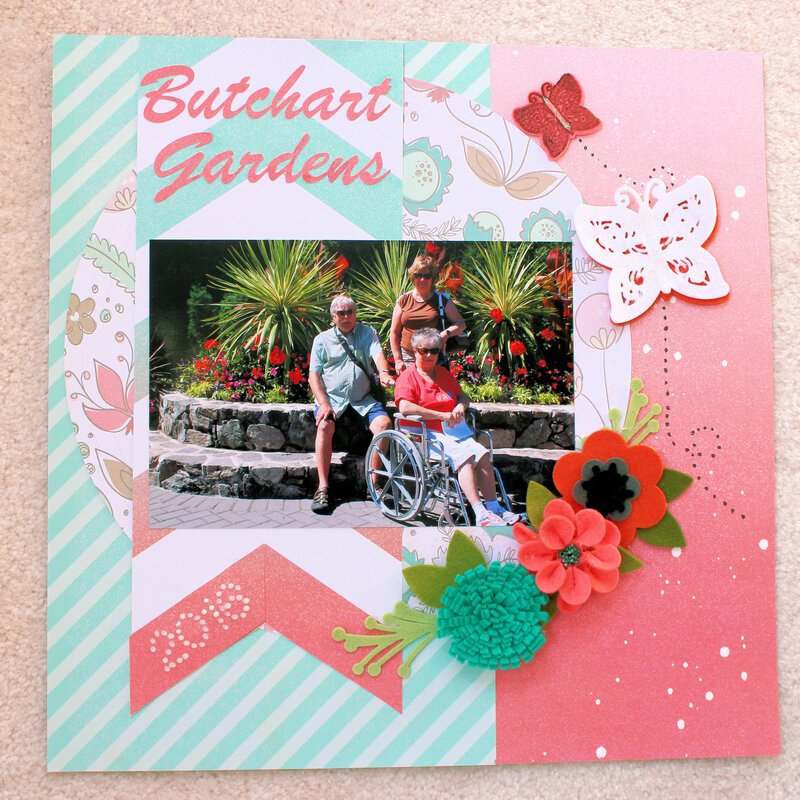 Stickles, Simon Says Stamp card base, Scor tape. 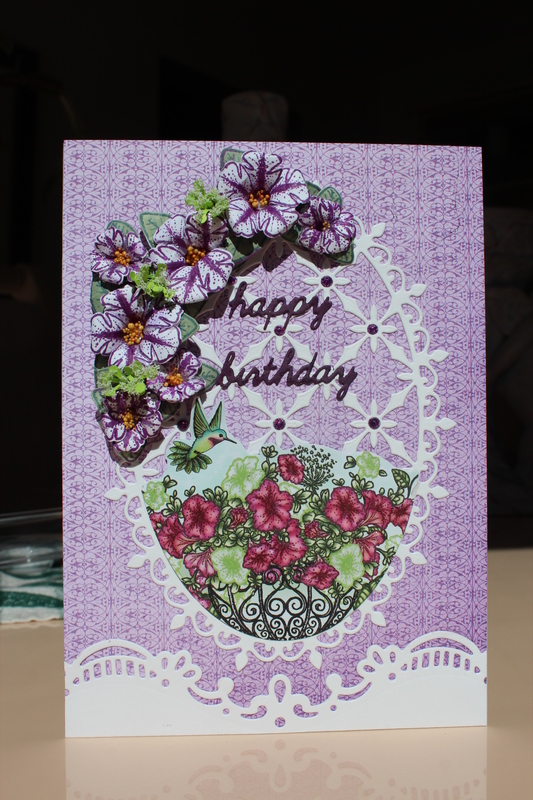 I recently acquired the Classic Petunia Collection from Heartfelt Creations. So far so good. Emma Lou suggests that shaping the Petunia is made easier by the use of a hot glue gun. Her sound reasoning is that the deep dimension of the Petunia requires a glue that dries instantly so that you can glue the pieces of the Petunia together sometime in this lifetime, and move on to the rest of the card. Here is where the trouble started. I realized very quickly that the Hot Glue Gun should be included in the registry of restricted weapons. It is truly out to hurt people. I should have realized that safety features were not front and center for a company designing a product to sell for two bucks at the Dollar Store, but come on people, this thing is truly vicious! It has these flimsy little feet on the bottom, with a regulation sized curled up electrical cord sticking out of the back. On what planet is that designed to sit up with out falling over and burning everything in sight. Even if you get the gun delicately balanced on its’ feet, the nozzle faces downward so liquid fire drips continuously out on to your desktop or project or fingers. So on to making the flowers. Unless I can quickly grow a third hand, this is a problem too. One hand, to hold the flower in the making. One hand to hold the fire leaking glue gun and oh oh, no hand to move one petal over to the other to actually glue them together. It is then that panic ensues and one finger instinctively moves over to force the two petals together. Yes Emma Lou is right, there is an instant bond…………..the petals…………..the molten glue……………..and your finger. I calculated that I could make about four flowers before I ran out of fingers without Band-aids on them, so I carried on. I realized then that it was a bit like childbirth……………….the result was worth the pain……………and you start thinking about your next project. Some weeks are just better than others, and this week was just the best! I was blessed enough to have another perfect grandson added to our family! Now I know I sound like Captain Obvious when I say this, but the birth of this amazing little child is truly a miracle! One can’t look at those perfectly formed little fingers and toes without tearing up at the wonder of it all. No fancy degree or lofty career or zeros in a bank balance can compare to the creation of this little life. So you probably think I will post a baby card today………………….nope! 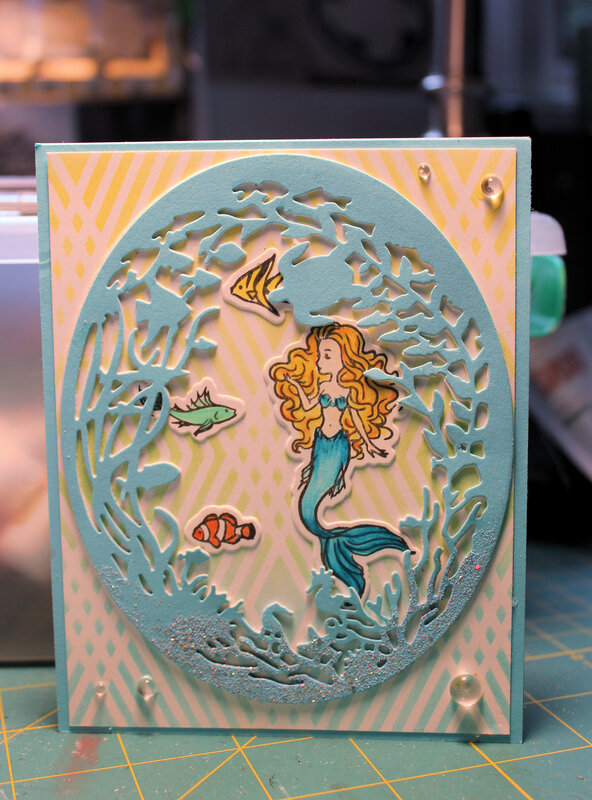 I have been playing with my Hero Arts May kit and decided to post the card that resulted from the craft session. Ocean backgrounds always seem to work. Whether I try for a realistic or cartoon like look, they seem to avoid the big round file. On this one I used the stencil included in the kit and Ombre Inks that I sponged on. I see that I should not have been eating greasy Cheezies while photographing my card. Please do not adjust your screen, there really is smudgy fingerprints on the card frame, but this week nothing is going to bother me.